Create, promote, and analyze your quizzes & survey with one simple tool. Create powerful quizzes to capture and qualify your leads with quiz types like personality, diagnostic, trivia, true/false quizzes, and much more. Create powerful surveys for marketing research, website feedback, Net Promoter Score, and much more. Audience insights start and end with LeadQuizzes. Create text or image-based questions and open-ended answers. Additionally, you can allow quiz takers to select one answer or all that apply. Create custom form fields to capture information like name, email, phone number, zip code, and much more. Design the look and feel of every piece of your content by adding custom background images, colors, and fonts. Offer your quiz takers a personalized experience by showing specific questions or results based on their answers. After a quiz taker completes their quiz, redirect them to your own custom website URL. Easily Drive Traffic to Your Quiz and Generate More Leads! One of the easiest ways to increase leads in your business is to set up a website popup with your quiz. Our website popup feature takes minutes to install and configure. Once you create your quiz, you’ll need to promote it across your website and blog. Our responsive embed code works across all major devices and browsers, capturing leads and data while you sleep! Our Facebook pixel integration allows you to build custom audiences and fire events based on quiz taker answers, results, and question drop off so you can spend your advertising on your most profitable audiences. Want to quickly promote your quiz on Facebook, from your website, or to your email list? Use our auto-generated URL to capture new leads. No landing page development or coding required! 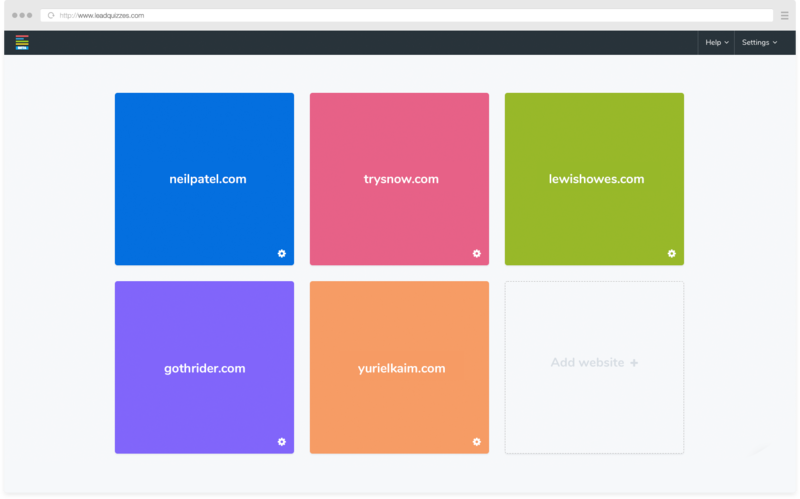 You can add multiple clients to the same LeadQuizzes account and manage them with a single login on our Marketer and Enterprise & Agency plans. LeadQuizzes makes it simple to share data between marketing tools so you can save time and money. Analyze quiz stats like where users "drop-off" and completion rates so that you can make adjustments and increase lead capture. Additionally, view answer summaries to learn more about your audience. Easily analyze individual responses and leverage the data you collect from your new leads.